(Nanowerk Spotlight) With its historic development tracing back to the Bronze Age, welding serves modern industry in broad areas such as construction, manufacturing, and engineering. Spot welding,a type of resistance welding used to weld various sheet metals, was originally developed in the early 1900s. The process uses two shaped copper alloy electrodes to concentrate welding current and force between the materials to be welded. The result is a small "spot" that is quickly heated to the melting point, forming a nugget of welded metal after the current is removed. Perhaps the most common application of spot welding is in the automobile industry, where it is used almost universally to weld the sheet metal forming a car. Spot welders can also be completely automated, and many of the industrial robots found on assembly lines are spot welders. With the continuing development of bottom-up nanotechnology fabrication processes, with self-assembly at its core, spot welding may likewise play an important role in interconnecting carbon nanotubes (CNTs), nanowires, nanobelts, nanohelixes, and other nanomaterials and structures for the assembly of nanoelectronics and nano-electromechanical systems (NEMS). Shrinking device size to nanometer dimensions presents many fascinating opportunities such as manipulating nanoobjects with nanotools, measuring mass in attogram (10-18 gram) ranges, sensing forces at femtonewton (10-15 newton) scales, and inducing gigahertz (109 hertz) motion, among other new possibilities waiting to be discovered. Nanorobotic assembly provides a new way to fabricate such devices by interconnecting as-grown nanomaterials or nanostructures with the ability of 3D positioning/orientation for site-selection. A team of researchers from ETH Zurich in Switzerland and Zhejiang University in PR China have demonstrated nanorobotic spot welding using single-crystalline copper-filled CNTs inside a transmission electron microscope (TEM). "We need more effective assembly technologies for strong and sometimes conductive interconnection of nano building blocks for fabricating nanosystems – nanorobotic assembly is one way", Bradley J. Nelson explains to Nanowerk. "Our technique is an important step for the interconnection of nano building blocks to assemble NEMS"
Nelson is Professor of Robotics and Intelligent Systems at ETH-Zürich and is the director of IRIS, ETH's Institute of Robotics and Intelligent Systems. Van der Waals forces, electron-beam-induced deposition (EBID), focused-ion-beam chemical vapor deposition (FIB-CVD), high-intensity electron-beam welding, Joule-heating induced joining, and nanomechanochemical bonding are experimentally demonstrated interconnection strategies, although all have limitations. Van der Waals forces are generally very weak, Joule-heating-induced joining and nanomechanochemical bonding are promising but not yet mature, and the other methods involve high-energy electron or ion beams, which significantly limits their applications. 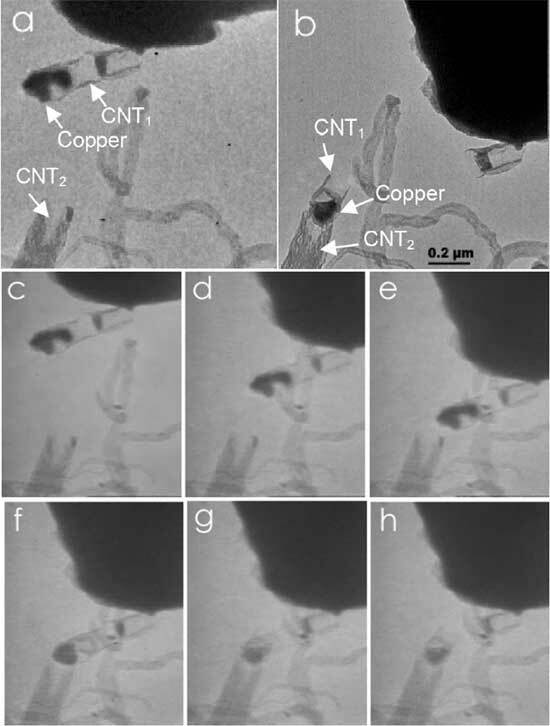 In contrast, Nelson's team realized the controlled melting and flowing of copper inside nanotube shells by applying very low bias voltages (between 1.5 and 2.5 V). The average mass flow rate of the copper was found to be as small as 120 ag/s according to TEM video imaging. The melting is a result of Joule heating, whereas the flowing is caused by electromigration. "The successful soldering of a copper-filled CNT onto another CNT shows promise for nano spot welding and thermal dip-pen lithography" says Nelson. "Furthermore, nanorobotic manipulation provides the possibility for 3D site selection, which is essential for complex nanoassembly, and the metallic (with copper) connection is significant for nanoelectronics system." (1) A very low current can induce the melting and drive the flow, which is much more efficient than irradiation-based techniques involving high-energy electron beams, FIB, or lasers. Combined with dielectrophoretic assembly, it is possible to solder the tubes onto electrodes for batch fabrication of NEMS. (2) The welding site can be readily selected using nanorobotic manipulation, which enables 3D position and orientation control for continuous mass delivery and will potentially enable 3D prototyping and assembly. (3) The melting occurs rapidly (at least at the millisecond level), several orders-of magnitude faster than using high-intensity electron-beam or FIB, which is generally on the order of a minute. (4) Because both the rate and direction of mass transport depends on the external electrical drive, precise control of an ultrasmall mass delivery is possible. Time-based control will allow the delivery of attograms of mass. (5) Copper has good compatibility in the conventional semiconductor industry. The experiments show that it will likewise play an important role for scaled down systems. Carbon shells provide an effective barrier against oxidation and consequently ensure a long-term stability of the copper core, which also facilitates the conservation of the material than conveying mass on the external surface of nanotubes. Nelson points out that the capability to deliver encapsulated materials from carbon shells is of great interest because of potential applications as sources of small numbers of atoms for nanoprototyping, nanoassembly, and injection. "A hybrid approach combining nanorobotic assembly with self-assembly may be an solution for the trade-off between complexity and productivity for nanosystems manufacturing" he says. This recent findings have been reported in the December 14, 2006 online edition of Nano Letters ("Nanorobotic Spot Welding: Controlled Metal Deposition with Attogram Precision from Copper-Filled Carbon Nanotubes").